I have a mail pile. I try to read things within a day or two upon its arrival to my lair. It’s not much of a lair but calling it a lair is cooler than just saying office. Except during important meetings. Saying lair as an adult causes others to question your grip on reality. It’s cool, I also have a stuffed Duck. If they can get past that, referring to the office a lair is a cakewalk. Once I read the mail, if it needs a response, I place it in another pile. This pile is high. I have reached December 2018 in the layered litter of letters. Susan Laffely sent us a card, a kind note, and a leather bound notebook which she created by hand. She’s got skills. You don’t just go out and purchase a notebook covered in calf skin. Especially if you need it to be stamped with a raised moniker of an American Wood Duck. This isn’t gonna be a Staples day. That’s NOT easy. The faux snakeskin interior really pops when you swing it open in order to inscribe your name in our visitor’s log. 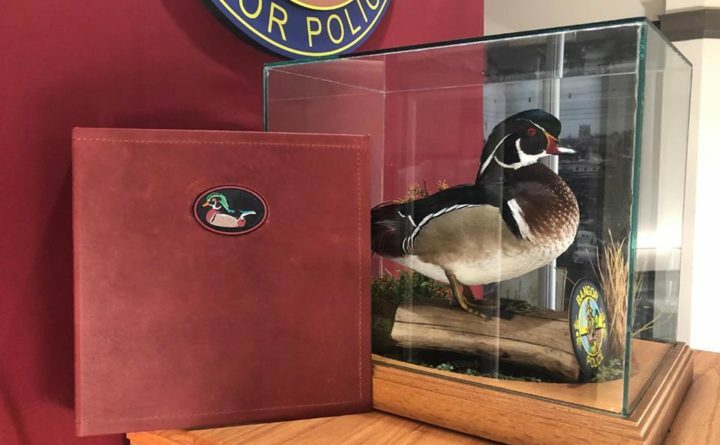 You can see the gift next time you stop to see the Duck of Justice. I called Susan last week; mainly to apologize for not thanking her sooner for her work. Susan runs Mac Mountain Tack Repair. She does saddles, blanket repair, canvas work and leather covered notebooks for the Duck of Justice. She is on the Falmouth Road in Windham, Maine (207-892-0161). She told me it was easy. I told her she was kind. Come see the Duck. We might just have to get a saddle.